We all want to feel powerful. I believe most of us really do want to use our power for the good of all, including ourselves. But few of us received the training we needed to show up in our lives or meet the challenges that arise as part of life from our most powerful self. We blame, manipulate, control, get bitchy, avoid, freak out, and think we are acting powerfully, when in reality we are acting from distortions of power inside ourselves. We find ourselves inside of systems or relationships that tell us we are being bossy or domineering or controlling if we try to exert our power. So instead of being received in our attempts to be what we think power looks like, we are chastised or ‘given feedback’ or met with hostility. How do you show up as a ‘powerful presence’ that doesn’t have to exert power or try to be powerful, but just IS powerful? This Feminine Power Time podcast is all about connecting you to the embodied center of your Divinely Powerful Self who can stand up, speak up, and show up as the loving, compassionate, fierce, graceful, radiant, centered, calm and clear being you are at your core. In your relationships, at work, in any and all situations so that YOU can be the powerful feminine presence you are, even when life throws a challenge at you, someone pisses you off, a person tries to bully or control you, or you are afraid and unsure. Most of us have learned to REACT from our emotions by using “Distorted Power” instead of RESPOND “Divine Power” and as a result create a lot more struggle, strife and clean-up situations we have to deal with. Some of us have learned and use the “Distorted Masculine” model of power – this is where you exert your will and power OVER someone or something. You bully, push, manipulate, control. It can be effective for sure, but let’s not kid ourselves. Power over is not true power. It’s based in fear, not love. Some of us have learned and taken on the “Distorted Feminine” models of power – blame, bitchy, passive aggressessive, manipulative in a martyr or victim way. Again not powerful although we may have relied on this kind of power for years to get what we want. Here’s a spiritual truth to chew on, and then tune into the podcast to get the full transmission & start applying this to your daily life. Feminine power is a presence. There is no need to prove. No need to manipulate the situation or try to figure out and strategize how to get what you need. No need to fight, have power over or control. Feminine power is not weak, although it can feel soft. Do not confuse gentleness with weakness. Feminine power is RESPONDING, not reacting. Feminine power is fierce grace. 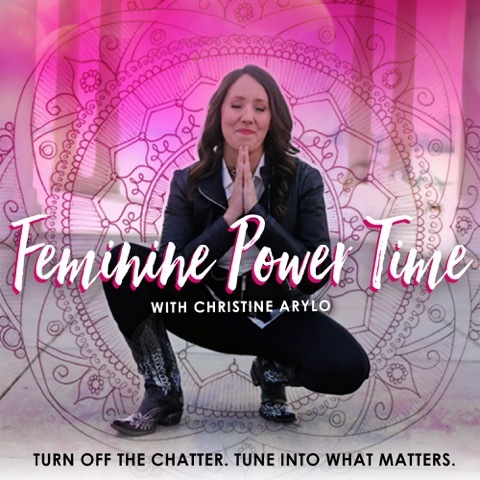 Tune into this session of Feminine Power Time & explore the difference between distorted feminine & masculine power and how it shows up in you and your life. Learn & FEEL what fierce grace is, and what your unique presence of divine feminine power feels like and looks like inside of you. And then learn how to apply it and practice it in your life right now. consider doing a 40 day practice. Check out the Burnout to Balance 40 Day Practice here. Error: Error validating access token: Session has expired on Friday, 19-Apr-19 12:24:14 PDT. The current time is Thursday, 25-Apr-19 11:42:39 PDT.